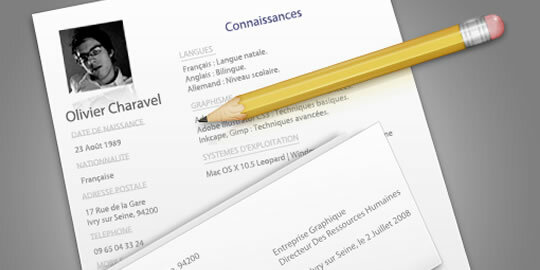 It’s estimated that 1 billion résumés are screened around the world each year. Employers typically take as little as 45 seconds to decide whether to reject it, put it down as a maybe or definitely interview. Naturally getting into the definite pile depends on your experience, your education and your suitability for the job, but it also depends on something else, the illusive X-factor. Being a human process, there are all sorts of psychological biases you can exploit, if you know how. Here are some research-backed tips that should help you on your way. Managing the impression you give to recruiters is important, but don’t exaggerate. Only show off about solid, concrete achievements. Knouse (1994) found that exaggerating personal skills and trying to ingratiate yourself with the reader was not effective. Save sweet talk for the interview—it will work better there. You should specifically target your knowledge, skills and abilities to the requirements of the job. Applicants who included relevant competency statements were rated more highly in one study (Bright & Hutton, 2000). Competency statements are things like: “Created new psychology website, demonstrating high energy, self-motivation and commitment.” Words like ‘demonstrating’ link what you’ve done to your qualities and skills. If you are blessed with relatively good lucks, but think your résumé is average for the job, then include a passport-sized picture of yourself. A study by Watkin and Johnston (2000) found that for high quality résumés, appearance made little difference, but when the résumé was average, a pretty picture could make up the difference. Most businesses aren’t particularly interested in your education, it’s experience that counts. As much as you may be proud of your qualifications, recruiters generally aren’t so interested. Try to play up your work experience as much as possible. If you include too little information, it will dramatically reduce your chances of being shortlisted (Earl et al., 1998). So make sure you give the employer ample information. On the other hand résumés longer than two pages are off-putting. Recruiters seem to be biased against coloured paper according to a study by Penrose (1984). The temptation is to use colour to stand out from the crowd but it seems it makes you stand out in the wrong way. It seems most recruiters don’t like creative layouts. When Arnulf et al. (2010) tested it they found that résumés with ‘creative’ as opposed to ‘formal’ layouts were only half as likely to be shortlisted. Once again, stick to the formalities or you may well suffer (this finding may not hold in certain creative industries). In theory recruiters shouldn’t be affected by such trivial things as the colour of the paper, competency statements or a picture on the front, they should be able to see through it to the real you. But in reality they are affected. The theory that so-called ‘applicant fit’ is the only criteria on which judgements are made is flawed. Sifting through the résumés is a human process, so don’t give the recruiter a reason to put you on the reject pile.